Hello, i have upgraded from release 4.4.3 build 9072 to release 4.6.4, but when use the project tools on one of our projects it gives "an item with the same key has already been added"
I'm almost sure that there are duplicate instances of an assembly reference in csproj file. If it is possible to check this on your side, and if so, remove the duplicates and run the tool again? 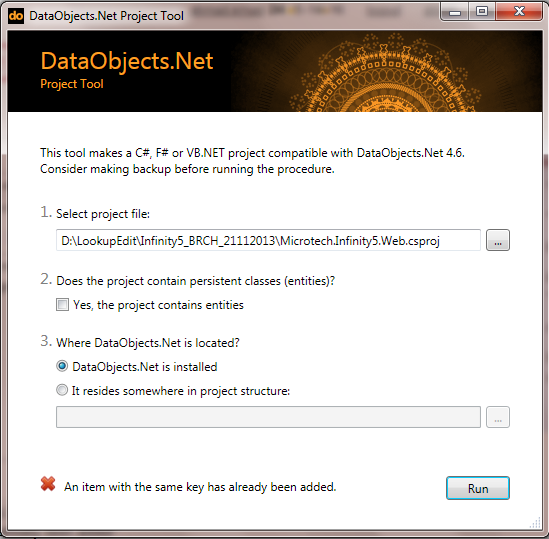 On our side we'll add this check in the new version of DataObjects.Net.